The Graphtec Automatic Sheet Cutter is designed to automatically feed and contour cut media size up to 13″ x 19″ without the need for an operator. Equipped with precision eye-mark CCD camera technology the CCD camera allows for quick reading of crop marks with a precision grade of 0.2 mm. It can handle up to 200 sheets (depend on the thickness) of media in a continuous cycle but with the ability to add further sheets as required without interrupting the cutting process. This is a capability that we consider sets the Graphtec Automatic Sheet Cutter apart from any comparable sheet-fed system. Graphtec Ce Lite-50 is the perfect machine for expanding into new markets or turning a hobby into a business. Features such as its 4.3” touch screen and numbered blade holder make operation intuitive for new and experienced users alike. Included, Cutting Master 4 Plugin for Illustrator or Corel Draw and a Standalone drawing program Graphtec Pro Studio Software provide all of the design tools needed to create a large variety of stunning Products. 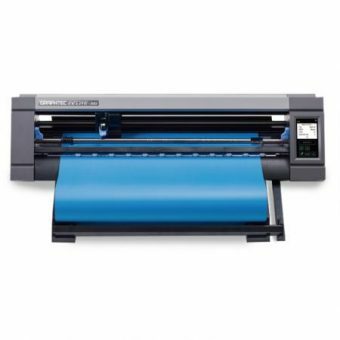 Unique superior quality, high reliability and affordable price of Graphtec CE Lite-50 is suitable cutting plotter for small-to-medium production runs for heat transfer vinyl, decals, singage, automotive sign, and more! The Graphtec professional class of CE5000 cutting plotters update the extremely successful CE3000Mk2 series with improved features. Professional flatbed cutting plotters (in a more compact size) capable of processing various materials with accuracy compliant to most industry requirements for pattern making. FC4500 Series are the ideal cutting plotter for high-precision and medium-heavy material crafting jobs and is suitable for cutting intricate designs on vinyl, photo-masking films, foam material, cardboard, oil board, and sandblast resist rubber. Suitable for PET (polyethylene terephthalate), Polyamide, Stiff paper, Cardboard, Microflute board or Industrial materials with precise adjustable cut pressure up to 600 gf. Flatbed FC4500 Series is the most economical solution for cutting thick, hard materials that cannot be fed through a roll-feed/friction-feed cutting plotter. Up to 600 grams of cutting force; more than tough enough for all sign media. The FXC2000 flatbed cutter is the ultimate solution for prototyping and small production runs of rigid packaging media and other sheet fed materials. With Graphtec’s medium to large flatbed cutting plotters, you have the right tool for contour cutting without requiring a die. Reduce media waste and processing time with included, dedicated software. Added offline, USB operation enables operators of all skill levels to process various types of media for cutting. The Optima V250 4’ x 8’ digital flatbed is the optimal cutting solution for all applications in the digital printing, packaging, signage, and apparel markets. Contour & die cut substrates up to ¾” thick including foam board, PVC, and varnishing plates / offset blankets with its dual tool head system and variety of tool options. Each tool head is independently adjustable, ensuring high quality results for every job.